The all purpose cleaner for all seasons and almost any surface. Super 10 is a non-flammable, non-volatile product which cannot catch fire or cause or create foam in rivers and streams. Because it is biodegradable it can easily be consumed by bacterial action in ordinary septic tanks and sewage disposal systems. Super 10 rinses cleaner than ordinary detergents, leaving no soap residue. Because of Super 10’s versatility, this one product eliminates the bother and, of course, expense of having a variety of special cleaners. Because it is concentrated, its cleaning power lasts longer and costs less. It dilutes instantly in any amount of water whether it is hot or cold, hard or soft. Super 10 contains no free alkalines, kerosenes or hydro-carbons. 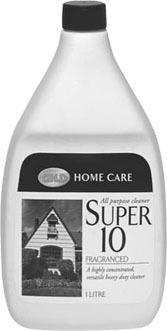 Super 10 is a balanced complex of reacted organic soap, mild solvents and super wetting detergent. This is what gives Super 10 the ability to function on such a wide variety of cleaning problems. Super 10 is especially effective on stubborn stains on fabrics, glass, china, wood, tile, painted surfaces, porcelain or partitionings. You will continue to use it outside your home on exterior woods and screens. It is indispensable for hard-to-remove spots such as food stains, puppy stains, etc. It is safe for all vinyl, tile, plastic, porcelain, enamel, carpets and upholstery. (Because certain carpets and upholstery may have inferior dyes, it is advisable to use a test patch before proceeding.) Super 10 can be used on tough jobs like ovens or garage floors. Safe to use on anything on which you can use water. Formulated for petroleum based dirts. You may comment on Super 10’s safety on all types of surfaces, its versatility, its concentration. Use standard demo board and black crayon. Work into carpet. Spray on Super 10 (mix 10 to 1 in front of guests), allow to soak while mentioning its value and mildness as an oven cleaner. Ask guests to name their current oven cleaner which will usually be highly caustic; compare Super 10 to their oven cleaner. You may ask your customer to hold out her hand. Spray Super 10 and then comment ”that’s my oven cleaner... it is completely non-toxic, non-caustic and biodegradable. It is effective and has 101 uses.” Complete demonstration by gently agitating crayon stain with finger and dabbing with any clean absorbent cloth - DO NOT RUB. Balance to make 100% is water. Free flowing, clear yellow liquid. Solutions in water penetrates and removes wide variety of soils. Exceptionally effective on grease and oil. Safe on practically any surface. Will not leave alkaline deposits. Liquid, transparent with yellow colour & glycol odour. Complete water and oil solubility. Freeze/thaw stability at 3 complete cycles. Read labels carefully for best results. Old blood stains, tar, tomato stains, car parts, tools and grills, spots on garage floor or driveway. Degrease engines - run motor until warm, spray on, let set for 15 minutes; spray again, agitate with brush, hose off. Repeat if necessary. Grouting - spray, let stand a few minutes, scrub with brush, rinse. Aluminium door and window frames. Driveway - do on a warm day, spray, use brush to work in, let stand, rinse using garden hose. Spray closets - eliminates odours. Brushes, combs, jewellery, luggage, plastic, vinyl, formica, stainless steel, walls (recommended for water base paints). Spots on carpet - spray on, agitate, and blot. Important to make sure carpet is colourfast. Spot cleaner for dry cleanables - spray on and blot. Distilled water is used to prevent water ring. Use Super 10 mixed 10 to 1. Spray on, agitate, and blot out. Use Super 10 mixed 10 to 1. Cuts down on odour and removes dirt. You might want to spray with Care to disinfect. Spray grease or oil spots (3 - 1 mixture). Use brush or broom to ”work it in” to allow deeper penetration. Let stand for 15 to 20 minutes. Now spray it off with forceful stream of water from garden hose. If floor has not been waxed, use 3 to 1 Super 10 and a nylon scratch pad. If they have been waxed, use 3 parts water and 1 part L.D.C., Lemon Glo can also be used to take up heel marks. Use Super 10 mixed 10 to 1. Spray it on and blot. Some inks contain insoluble dyes and cannot be removed. Super 10 will not remove dyes. Spray on, let soak a few minutes, then put in washing machine. Use Super 10 mixed with DISTILLED WATER. Use 10 to 1 mixture in spray bottle. Spray on and blot. Distilled water is used to prevent water ring. Using just enough concentrated Super 10 and GNLD’s G1 to make a thick paste, apply with a soft brush and rinse. Heat oven to 93ºC. Turn oven off. Spray with mixture of 3 to 1 Super 10, using the fine stream adjustment on spray bottle, not the fine mist. This gives force behind the product. At first the spray will evaporate. Keep spraying until the oven walls are saturated. Let it soak. Super 10 will do the work for you. Wait about 10 - 15 minutes and then wipe out with a steel wool pad. Do not use wire or sponge pads because these counteract with our chemicals. Rinse. 300g G1; 60ml L.D.C. ; 60ml Super 10; and 60ml Carpet Glo. Mix in a 5 litre container and fill up to 4,5 litres with water. Mix this 3 to 1 and use the same method of cleaning as with Super 10. Spray on ... give it a few minutes to work, and wipe off. For excessively greasy area, increase Super 10. Use 3 to 1 Super 10 or just the concentrate and steel wool to remove rust and lime deposits. Dampen stain in cold water. Spray Super 10 on stain. Agitate a little and allow to soak a few minutes. Wash in usual manner. Test for Colourfastness Before Use. “Freshly spilled” spots - Blot up excess with a clean cloth once or more times to take up as much as possible. Spray lightly with Super 10. Wait 2 or 3 minutes until it absorbs stain. Blot up again with absorbent cloth. Spray lightly again if necessary. For stubborn stains, agitate with fingers or brush. For stains of long standing, it may be necessary to repeat the treatment. Let dry. Vacuum. DO NOT OVERSATURATE WITH SUPER 10. Pre-spot with Super 10 before using carpet shampoo if necessary. Vacuum carpet twice in opposite directions. Mix Carpet Glo - 40 parts of water to 1 part product. Mix this in a bowl and agitate with sponge or egg beater to make foam. Apply only the foam to the carpet, allow to dry, and vacuum. For small area use spray bottle. Larger areas - one capful of Super 10 in 4,5 litres water, or more Super 10, for extremely soiled area. Spray on while engine is warm (3 - 1 mixture), let stand for 15 minutes, spray again. Agitate with brush. Rinse with garden hose. Repeat if necessary. Floors. For Best Results, Read Complete Instructions Before Proceeding. Unwaxed Floors: Use 3 caps of Super 10 per 4,5 litres warm water. Apply to floor with cloth or mop. (Allow time to soak if floor is extremely soiled.) Wipe clean. Rinse with clean warm water. Waxed Floors: Note: Super 10 is not recommended for cleaning waxed floors as one of its uses is to remove wax. For cleaning waxed floors, use one capful of undiluted L.D.C. to 4,5 litres water. To maintain the beautiful shine on your floor, you can use one cap (5ml) of Wash ’n Wax per 6 litres water, along with Fantastik. To Strip Old Wax From Floor: See Wax Removing. Spray on. For easier cleaning, let stand for a few minutes. Clean with old toothbrush or other small brush. Almost every juice stain will respond, including grape, if it has not been “set” with hot water by previous attempts to remove it. After spraying, allow enough time for Super 10 to absorb the stain colour. 10 parts water to 1 part Super 10. Spray or wipe on. Agitate with brush or sponge and wipe clean. No rinsing necessary. A few drops in a spray bottle. If mixture is too strong it will cause streaking. Such as seat covers, car-door panels, plastic upholstery and toys. From chrome, from carpets etc. On stainless steel sinks etc., it is sometimes necessary to use steel wool to rub spot after Super 10 has been applied and allowed to stand for a few minutes. Increase strength if necessary. Spray on 1 to 10 mixture Super 10 and wipe off dirt. Increase amount of Super 10 if blinds are excessively dirty. Enamel Surface: Two capfuls of Super 10 per 4,5 litres water will clean most enamel surface walls. Use stronger solution for marks on walls when necessary. Work from bottom of wall up to prevent trickles from leaving unevenly clean walls. Stains: Grease spots, stains, even TAR usually disappear if you spray 1 to 10 Super 10 mixture on spots, let stand for 15 to 20 minutes, and then put garment in washing machine with other clothes to be washed. Spray 1 to 3 mixture on dirty shirt collars, make-up, etc. Spray or wipe on, allow to stand for a few minutes and wipe up the wax. Apply again if necessary. THE WATER SHOULD BE HOT. Rinse with vinegar water before rewaxing the floor. Woodwork, Desks, Chairs, Mahogany Doors and Wall Panels, Painted Walls, Tiles, Porcelain, Granite Walls etc. 10 parts water to 1 part Super 10. Apply with sprayer, sponge or damp rag, allow time to soak. Wipe clean with a dry rag. No rinsing is necessary. When mixed in a bucket, dilute 40 to 75ml Super 10 in 4,5 litres warm water. No rinsing required. Wipe dry with toweling. May also be applied with hand sprayer. Work from bottom toward the top. Normal usage of Super 10 and other GNLD products helps keep systems clear and working. Dirt and grease are held in suspension. Pipes and plumbing are kept free and clean. 5 parts water to 1 part Super 10. Cleans metal. Removes most rust spots. Does not pit chrome. Spray or wipe on, rinse and wipe off with dry terry cloth or paper towel.